Here is a lessor known, absolute gem of a hors categorie climb in central Switzerland. 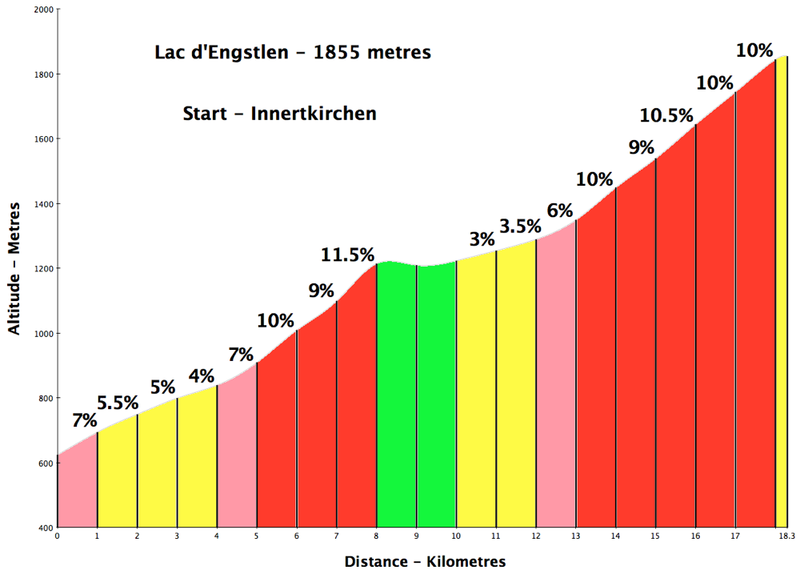 Here is a lessor known, absolute gem of a hors categorie climb in central Switzerland. One of the best climbs under 2000 metres that I have ever done. 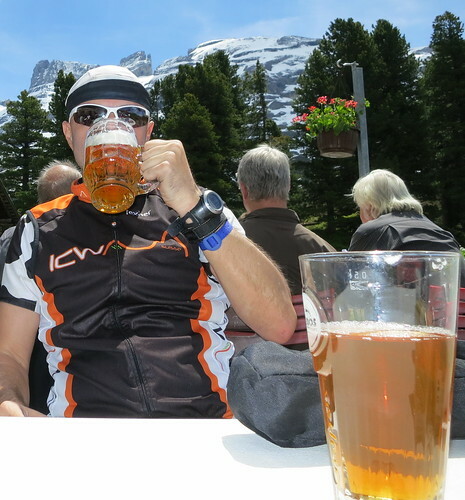 It’s difficult to be in Meiringen at the base of Grimsel pass, Grosse Scheideggg, and Susten pass and cycle something else. But I made a very good choice. The climb shares the first four kms with Susten Pass but then turns off onto a well-surfaced, narrow road. It’s private and has a car toll a little higher – which keeps the traffic to a minimum. Sweet! The early slopes wind up through the woods, with plenty of peeks at alpine peaks. NB: The map below includes the gigantic Susten Pass – which I did later in the day – but I’ll do a separate blog post for it. The last stretches are steep but lovely, I suffered with a smile. Finally an important tip: the road does not go to the lake – it’s perhaps a kilometre after the road ends. 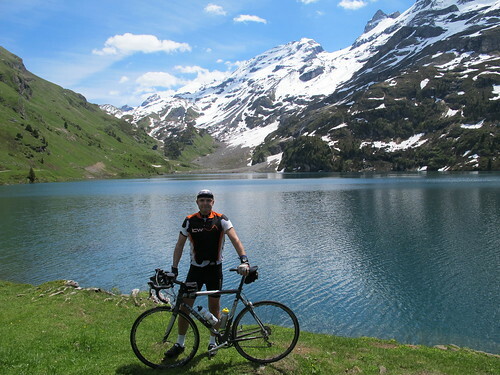 I performed a little cyclocross and walked as well – but essential to see the beautiful alpine lake. And then a beer to celebrate. This ride does not have to be an out-and-back, you can actually go over a pass at the head of the valley. Turn left at the hotel and you’ll end up on a small track heading towards Tannalp and Melchsee. On a cyclocross bike with 28-30 mm tires, I only had to walk a couple hundred meters out of the 2 km long off-road section, but on a road bike it wouldn’t take long even if you walked it all. From Tannalp, there is a great little road that goes all the way down towards Sarnen and onto Lake Luzern. Also, there is an even better way to start this ride. 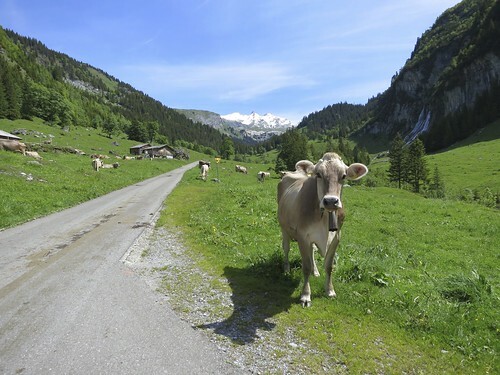 Take the unpaved road out of Meiringen up to Hasliberg, the road is signposted as part of National Bike Route 9. It’s unpaved and is steep for about 4km, but very good quality and is easy to ride on a normal road bike. Turn right when you get to the main road at the top, then follow the road around and into the valley that leads to Lac d’Engstlen (Engstlensee) that road is closed to through traffic, so it’s very quiet and the views across to the big peak of the Bernese Oberland (Eiger, Jungfrau, etc.) are incredible. PS It great to see you back posting great stories about beautiful rides, Thanks Will. Thanks for the tip Will. I wouldn’t have found this climb otherwise. It was really awesome, although it nearly ‘killed’ me. Maybe I shouldn’t have done this HC-climb after Grimsel-Furka-Grimsel 😉 , but hey, I had some energy left and that guy on the internet said it was so beautiful. That is was beautiful and unspoilt and very quiet, I could only appreciate on the way down. Going up, all my attention was focussed to control my heartbeat, drink (it was hot today), and suffer. Smiling was postponed till the beer at the kiosk. Those last kilometers are killing! 11-12% on ends! But as always: the suffering is forgotten once you are at the top and have a fast descent to look foward to. Excellent. Well done. Thanks for the note.